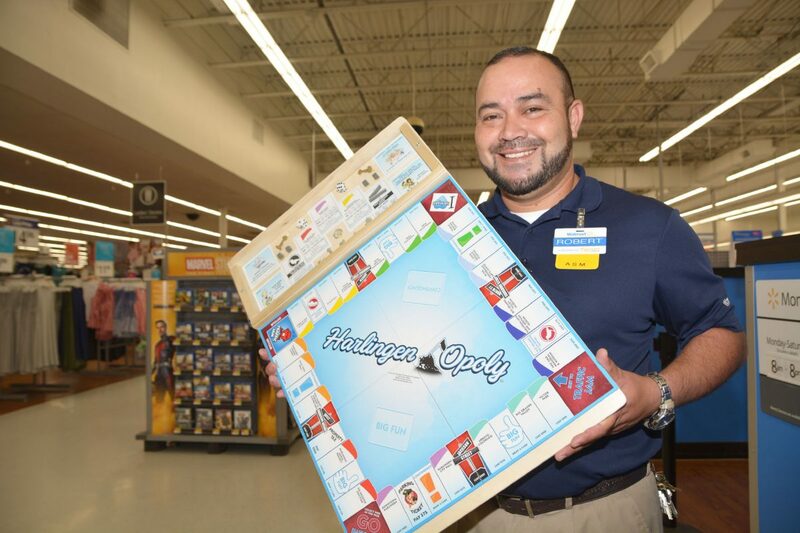 Robert Escobar, assistnat manager at the Wal-Mart at 1801 W. Lincoln Ave., shows off a display of the new game Harlingen-Opoly. The firsrt 750 copes are sold out, butr Escobar says he'll have more in later this week. A variation of the popular board game “Monopoly” has been re-invented as “Harlingen Opoly,” and Wal-Mart can’t keep the thing in stock. Escobar said the store has sold about 750 copies of “Harlingen Opoly” at $19.98 since Thursday and has ordered more. They should be here later this week. Since its debut in 1935, Monopoly has been a staple of friendly and not-so-friendly family competition, with an estimated 1 billion people having played the board game. Like the original,”Harlingen Opoly” consists of a goal to amass and consolidate property and bankrupt your competitors. These city-centric “Monopoly” games are a new twist and are available for a number of other cities in Texas and elsewhere. “ I felt people would really like to play a game featuring places they’re familiar with and after talking it over with my district manager, I reached out to the store directors in our region which includes Port Isabel, Los Fresnos, Brownsville, San Benito, Donna, Weslaco, and Edcouch-Elsa and they also agreed to get them for their stores,” said Tino Vidaurri, store manager at the Lincoln Avenue Wal-Mart in Harlingen. Escobar said “Harlingen Opoly” has been so popular, his Wal-Mart has been receiving calls from all over Texas from people originally from Harlingen seeking to buy a copy. “We didn’t expect it, being a smaller Valley city, to boom the way it did,” he said. The Harlingen version of the board game includes game tiles like Six-Shooter Junction, Harlingen Mural Project, West Harrison Avenue, Valle Vista Mall, Classic’s Bar and Grill, Colletti’s, Stefano’s Brooklyn Pizza, J. Lewis Boggus Stadium, HCISD Performing Arts Center, Harlingen Arts and Heritage Museum, Rio Grande Valley Birding Festival and the Iwo Jima Memorial and Museum, among other landmarks both commercial and public. Like Serna, Escobar also noted the potential of the board game to help kids learn about their city.